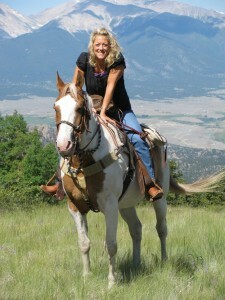 Superb daily trail rides are Elk Mountain Ranch’s most distinguishing features. 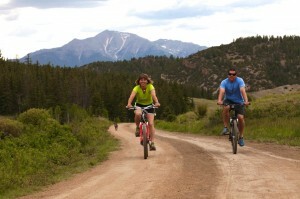 The high, remote location offers miles of trails through aspen forests and open parks. The ranch owns an excellent string of horses, and they are matched to the rider’s abilities, offering an opportunity to bond with your very own horse for the week. Rides are kept small in size and all are accompanied by a competent and caring wrangler. Tom’s a true believer in natural horsemanship, and the Monday morning orientation at our dude ranch in Colorado is both informative and entertaining. Ride options include lunch on the trail, a champagne brunch ride, and opportunities to trot and canter based upon riders’ abilities. Ride the rapids of the roaring Arkansas River through the heart of Brown’s Canyon – and the most recently designated Browns Canyon National Monument. Buena Vista is known as the “white water capital of Colorado.” Enjoy a full-day raft trip with lunch on the river bank. You will be in the hands of a thoroughly professional and bonded rafting company who will provide fully equipped white-water rafts, expert boatmen, and life jackets. Wetsuits and booties are available to rent for a minimal charge. The remote high mountain location of our dude ranch in Colorado places you in the very heart of unspoiled wilderness scenery. Single track or dirt roads can be hiked, biked and explored. Mountain bikes are available for your use. Wildflowers and wildlife are abundant. Just over every rise is a ghost town, a prospector’s cabin or a mine shaft tailing left as historic testimony of the gold and silver rush fever of more then a century ago. To give our guests a chance to appreciate our region, we offer weekly vehicle trips to Aspen. Aspen, formally Ute City, is one of the most famous ski resorts in the U.S. During the summer it offers the visitor a day filled with tours of historic buildings, fine shops, boutiques, and quaint restaurants. The spectacular drive to Aspen will take you across Independence Pass, the Continental Divide, and Mt. Elbert… Colorado’s highest. 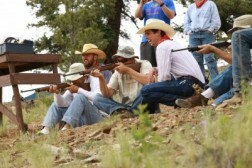 Included in your stay will be the opportunity to “prove” and “improve” your marksmanship on our ranch target range. We provide the guns, competent supervision and instruction, and the targets. It’s great fun and something you will want to try your hand at if you have never had the chance. Experience this state-of-the-art adventure challenge . . . with zip-lines, high rope bridges, a giant swing and much more. The Browns Canyon Adventure Park is the perfect addition to your Colorado family vacation! This off-site excursion is included in your stay. Bring your flyrod or spinning tackle (or use ranch equipment). There are two stocked ponds on the ranch property. Professional guides will be at the ranch on Tuesday afternoon offering a hands-on fly fishing clinic. Option for a guided trip on the Gold Medal waters of the Arkansas River can be arranged at an additional charge. We can show you how to clean your trout, and we will fry it for dinner. Delicious. Enjoy hayrides, campfires, archery, horseshoes, volleyball, badminton, tetherball, basketball, arena soccer, softball, square-dancing, musical entertainment, checkers, chess, backgammon, frisbee, spectacular sunsets, and more. Massage is available. There is also a golf course nearby.